The Winston is a cleanly-designed riser with an effortless adjustment mechanism and a powerful lift strength. The Winston's biggest advantage is its locking air cylinder, which prevents the work surface from moving out of place and lets you switch from sitting to standing with a hand lever embedded in the underside of the work surface. This quick adjustment method, coupled with an impressive weight capacity and the ability to hold as many as four monitors, gives it an edge in usability. One sour note is its lack of an independently adjustable monitor-height setting, which prevents the Winston from being a perfect ergonomic workstation. One-, two-, and three-monitor Winstons arrive within twelve business days of order placement. Four-monitor Winstons are special orders arrive within four weeks of order placement. The Winston ships out of eastern Pennsylvania by UPS Ground. The Winston has an easy, elegant adjustment method: simply press the lever on the underside of the work surface to raise or lower its height. Winston's locking air cylinder can keep the work surface in place, preventing it from moving out of place. It also sports a high weight capacity, and can support as many as four monitors. Without a method for adjusting the height of the monitor relative to the rest of the workstation, users aren't able to easily fine-tune their monitor to an optimal ergonomic position. The Winston is an attractive product, and has enough color options to ensure that it won’t clash with your office décor. With the added convenience of its brake handle height-adjustment feature, the Winston has its own fresh idea to bring to the table. Its dual-, triple-, and quad-monitor capability will also appeal to workers for whom the low weight capacities of other desktop risers have been an obstacle. But its lack of an independently adjustable monitor height setting, coupled with the possibility of the brake cable coming loose, keeps us from giving it the full 5 stars. We’ve seen so many office fitness products come through the WorkWhileWalking test labs that we aren't often surprised or delighted by truly innovative newness. 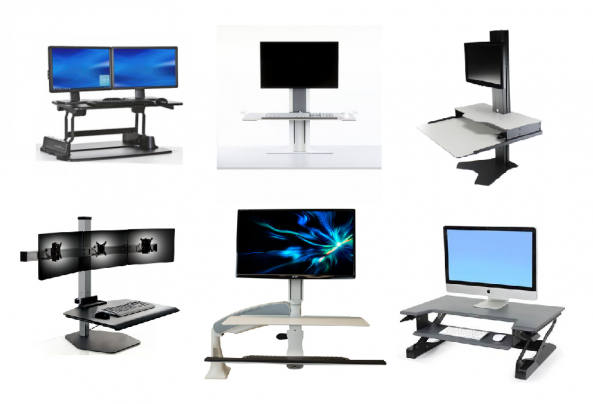 Let’s just say there are a lot of “me too” products out there, especially in this fast-growing category of sit stand workstations (a.k.a. “sit-stand desks” or “desktop risers”). In addition to some of the more popular models, like the Varidesk and the Ergotron Workfit-S, we’ve also seen our fair share of oddballs – niche products that, while ultimately not the most universally appealing, nevertheless have interesting qualities. But every once in a while, a sit stand workstation will come along that brings something new and forward-thinking to the table (or desk, in this case). The Winston, from Innovative Office Products, is one such riser, though it’s not without its shortcomings. Note: A similar product with electric height adjustment is the Winston-E. Check out our full review here. We first examined the Winston Workstation prototype at the NeoCon 2014 office furniture trade show, before it was ready for prime time. 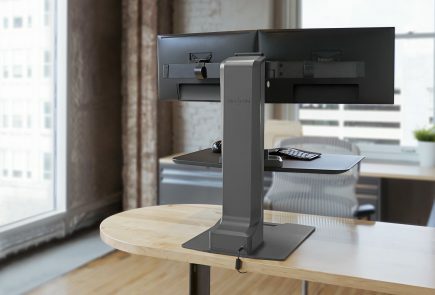 At first glance it appeared to have fairly conventional design—a gas-assisted, adjustable-height central column, with a work surface and monitor mounts not unlike other manual-adjustable risers such as the Kangaroo and Quickstand. What set the Winston apart was its unique height adjustment method: It employed a Bowden cable, like the sort used for bicycle brakes, connecting a locking cylinder inside the central column to a foot pedal. The Winston’s unique adjustment system stood out not just for its novelty, but because we could see it being a significant advantage in the ease with which the user could switch from sitting to standing position and back. The Winston has since replaced the foot pedal we saw at the trade show with a hand lever embedded in the right underside of the work surface, a design decision both more discreet and practical for a sit stand workstation. We've received a new production Winston Workstation at the test lab and have been able to take a much closer look at this unique adjustment feature, as well as the Winston’s other capabilities. The first thing to note is that the product is very well packaged, with each individual component surrounded by at least an inch of foam on each side. Detailed diagrams in the instruction booklet make assembly relatively simple and straightforward. The main components are the lifting column, a 30-inch wide work surface, monitor clamp, and whichever of the three desk mounting methods you happened to choose. Our Winston model relies on a heavy freestanding steel base like the Kangaroo’s, though a desk-edge clamp and grommet thru-mount option are also available for an additional cost of $89 and $39 respectively. The Bowden cable comes pre-attached to the work surface – just insert the other end in the socket inside the lifting column. A plastic accessory tray is attached to the top of the work surface near the back. It can hold your phone and keys, but isn’t all that impressive and is actually the one flimsy, albeit non-essential, component of this otherwise cleanly-designed sit stand riser. The Winston also comes with cable management clips that attach to the monitor mounting bar. They’re not as elegant as the Quickstand’s cable management system that secrets all the cables down the inside of the column, but they get the job done. The last part of the assembly is attaching the monitor mount to the lifting column. This was our first disappointment with the Winston. The mounting clamp can be set anywhere on the column, but once set, there is no way to adjust the height of your monitor relative to the work surface height without getting the tools out to remove the clamp. That meant setting it up only to find it a couple inches too low or too high, and trying again and again until the monitor was the right height. Why is this an issue? People’s body ratios vary. Some people find that the height difference between keyboard and monitor vary significantly when they stand versus sit; others find that it’s about the same, or close enough that it doesn’t bother them. Before investing in a Winston you’ll want to make sure that you’re OK with having that distance more-or-less fixed. Otherwise, look to Kangaroo or other products that make it easier to independently change the monitor height every time you switch from sitting to standing and back. 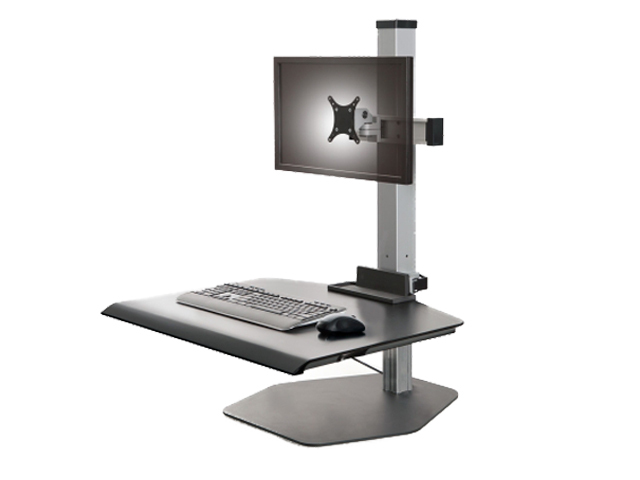 The Winston has capabilities more or less on par with the rest of the sit stand workstations. The 17” range of height adjustment brings the maximum work surface height to 18.4”. The lever-operated height adjustment makes switching between sitting and standing effortless. One of the more irritating aspects of the Kangaroo is the need to lock the work surface in place manually by tightening a friction knob located on the lifting column. With the Winston's Bowden cable, this cumbersome task is not necessary. The Winston's locking cylinder also keeps the work surface in place—unlike the Quickstand, which has a tendency to shift downward as you type. Unless you’re squeezing the Winston’s release lever, its work surface isn’t going anywhere. However, the work surface still demonstrates a bit of shakiness, something endemic to most of the risers currently on the market. Once you have a keyboard set up and start typing, you’re going to notice the work surface shaking. It’s not as bad as some of the other risers, but still not as solid as the Kangaroo when you have that kludgy—but nevertheless useful—stabilization leg underneath. Most desktop risers can accommodate dual monitors, but the Winston takes it a step further with its ability to mount up four monitors side-by-side—no easy feat, since monitors can easily weigh up to 10 lbs each. Of course, having the ability to lift that many screens necessitates a strong lift capacity. Thankfully, the Winston has some rather high weight ratings, with the 4-monitor model rated as high as 40 lbs. While our experience with the Winston has been mostly positive, we did run into a major problem early on in our evaluation. While raising and lowering the work surface, the column-end of the Bowden cable somehow detached itself from the catch that held it in place. Without the Bowden cable correctly attached, we couldn’t make any height adjustments. Not only that, but accessing that part required separating the lifting column from the metal base. Once there, it took two of us an inordinate amount of time and effort to get the cable back into place as we struggled to properly seat the cable guide and insert the cable end into its attachment point in the column. It’s a headache we haven’t had to deal with since, and the Winston is backed by a reliable 5-year warranty, but it is something we would caution readers to be attentive to as they assemble their Winston. Ostensibly there are only four different models of the Winston – the single, dual, triple or quad-monitor versions. However, it also comes in three colors and three different desk mounting options, for a total of 36 permutations of a single product. As far as pricing goes, the number of monitors and the desk mounting option are the determinants how much your Winston would cost. See the Pricing Options tab for all the choices. The Winston sit stand workstation is a well-designed product that manages to innovate in a category rife with cheesy "me-too" products. The Bowden cable may require special attention to make sure it is seated correctly, but once properly installed it forms the core of the most effective, intuitive, and, dare we say, elegant height adjustment mechanism we've seen on a desktop riser. The Winston costs slightly more than the average for sit stand workstations, but offers one of the largest worksurfaces available and features an effective, streamlined design overall. The Winston also has one of the highest weight capacities we've seen outside of the much more expensive, electric designs, such as the Winston-E. This sit stand riser is a great choice for people who want to stand but can't or don't want to swap their existing desk for an adjustable height one, and one of the only choices for such people who want to use more than two monitors. The Winston comes standard with a freestanding base. Innovative Office Products, the company behind Winston, also offers a desk edge clamp mount for an additional $89, or a grommet through-mount for an additional $39. The Winston comes in black, white, or silver. The single- and dual-monitor Winstons ship in 2 days. Custom orders (such as for 3- or 4-monitor models) ship in up to 3 weeks. Winston is covered under a 5-year warranty for parts. I recently purchased a Winston sit/stand (quad monitor) workstation. Whether this is a dual, tri, or quad, my review does not change. DO NOT PURCHASE this product! The basic feature of the product sit/stand was not designed to work for both the sit and stand because the monitors will only be at the correct level for one position, not both. These workstations have fixed positions for the monitors relative to the keyboard. You can adjust the level of the monitors using an allen-wrench, which is provided, but when you change to the other position (sit/stand) the level of the monitors are incorrect. In fact, my neck started straining after use. What bothered me the most was when I contacted Innovative, they knew about that fundamental limitation! It’s a design flaw and I could not believe they were still selling this line of products. Note, that your item is returnable but they have to receive the product within 30 days of purchase. Also, the customer is responsible for the return shipping which is incredibly expensive for a product that is around 100lbs. My return cost me $200+. Hate them. If we could get a full refund, we would.